Pelican Product: 9781589805682, WILD TEXAS STAMPEDE, THE! Ima Hogg has a big problem. Her father is traveling to Austin, and she’s in charge of running the house and watching her little brother, Tom. Ima knows she has to listen to her father, but Tom and the animals on their farm aren’t going to make that easy. With buffaloes, ostriches, and elephants living on their one-of-a-kind farm, there are plenty of ways for Tom to cause trouble. After flashing a red bandana in front of the buffaloes, Tom tries hypnotizing the ostriches and scaring the elephants with a mouse. When a stampede breaks out on the farm, Ima has to save her little brother, calm down the animals, and teach Tom a lesson he’ll never forget. Ima Hogg, the daughter of Governor James Hogg, was a real girl who was born in Texas in 1882. She and her family actually owned a wonderful menagerie of exotic animals, and her younger brother Tom was just as mischievous in real life as he is in this unforgettable Western story. 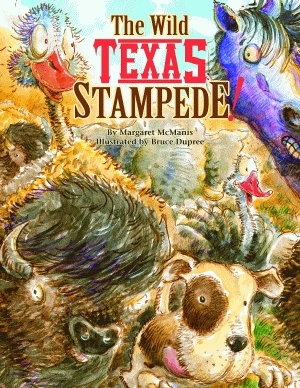 Margaret McManis spent her childhood only a short ride away from the Varner-Hogg Plantation in Columbia, Texas, where The Wild Texas Stampede!, her first Pelican children’s book, is set. She has traveled to Versailles, France, to study the gardens there and wrote an article about how they influenced Ima Hogg’s Bayou Bend Gardens in Houston, Texas. McManis has more than thirty years’ experience as a children’s librarian and has worked in public and school libraries in the Austin, Houston, and Angleton areas. She lives in Conroe, Texas. For the past nineteen years, Ozark, Alabama, native Bruce Dupree has worked at Auburn University as an art professor and director. He received a MA in illustration from Syracuse University. An accomplished artist, Dupree was the recipient of the CASE Gold Award for illustration and has been recognized by the Society of Illustrators as a top artist in the field. Dupree lives in Auburn, Alabama.